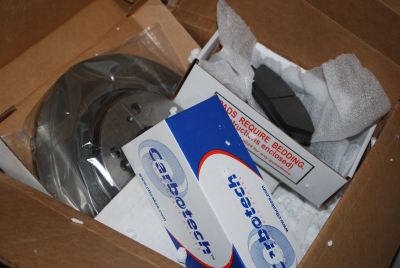 Brake pads and rotors arrived today from Carbotech. Don't know when I'll be putting them on the car, since I'd need a friend to volunteer their garage, jackstands, and some expertise for me to actually be able to do it. On the other hand, the existing brakes work well enough for now. The box was on my doorstep when I got home from work this evening. 58 pounds is equivalent to 26.3kg, by the way. Oh yeah, for some reason the box also contained packing peas. Like they'd help if this mass got dropped... They got pretty much flattened and crumbled and crushed during transport, so I can't give them away or drop them off at a shipping place like the ones before. I guess I'll just have to put these into recycling or something. Who knows whether they are even recyclable. If you want to use the lift at my house some weekend, let me know.